Celebrate the arrival of twins with this stunning gift for twin babies, featuring 2 hand painted wooden blocks filled with adorable baby items embroidered with either prince or princess! 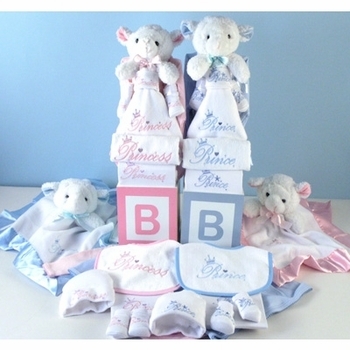 All these wonderful layette items are of the highest quality and made in the USA! Delivered beautifully gift wrapped ready to thrill mom and dad.